1) By call it 'standard at some point' you're essentially breaking the format. For one, not everyone remembers what 'was' standard at some point. 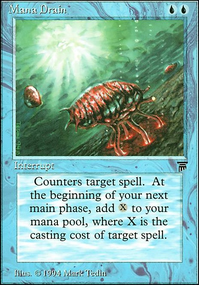 For two, there have been numerous times when standard has had to be redefined; there was Ravager before Skullclamp and then clamp was banned so there was Ravager after skullclamp. You need to have a strict definition of what players can and cannot do. Here's the proposal: that the format be formally defined by card pools, each containing a few sets and each with its own banned/restricted list. These card pools are engineered to coincide with standard rotations so the general theme of 'what was once standard' still applies but as a guideline and NOT a rule. The RULE is that players may choose from one card pool and build their deck entirely within the constraints of that pool. 2) Based on what I've read so far (admittedly not enough) I think the approach of deciding on what decks players can use is way off. Go back to the baseline rule and allow players to build whatever they want to build. Someone made a comment about narrowing the metagame, but this is exactly the opposite of what we want. 3) on Banned/restricted cards, you have to get away from the mentality of banning cards every time someone uses it to beat you. The only time a card should be banned is if it warps the meta in such a way that it's no longer fun. But the reality is that the strength of this format is it's self-correcting. 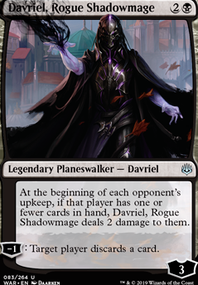 Yes, a lot of people may play Ravager, so then the few people playing Stars & Stripes or Prosbloom will wipe the tables clean. Jitte is strong, yes, but then so is a lot of other stuff from a lot of other pools. The strength of the pools is such that it allows us to be extremely flexible. 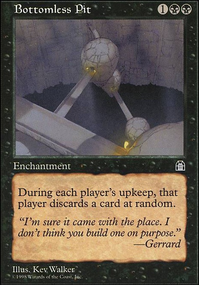 Just one example: in the (onslaught + Mirrodin) 2004 pool, you could ban Skullclamp and in the 2005 pool (Mirrodin + Kamigawa) you could ban Arcbound Ravager and all his friends. This would ensure players would still have access to some broken cards, but not necessarily be able to assemble them together. Here's another example: back in 1996, Mind Twist was banned in Standard. I've done some testing on this; it's really no that degenerate anymore. Not that it's not strong, but the rest of the pools are SO strong that we can afford to allow the 1996 pool access to Mind Twist without creating a degenerate metagame. Again, it's not the card but the context it's in that matters. Use of pools allows us to control the context. 4) on that note, why oh why would you limit the pools to the most recent sets? Dude! Go back. All the way back to 1996 and have a pool for each year. There are soooo many decks out there, some of them were broken then but weak now, some were nothing then but fare much better now. Give players the opportunity to find their own solutions. I promise you: the format will correct itself. Mind Twist is listed as ban in duel commander :( Can fix this please guys ? You could replace your Counterspell with a Mana Leak which is 10 times better in 3 colors decks and maybe add signets (matter of taste and curve). @stillenacht288: Devastating Dreams looks sort of like a cheaper but worse Death Cloud ... and I'm not actually that happy with Death Cloud as it is. :/ Yeah, people have rocks, but, the places where you want to blow up all the lands aren't too common - you have to have pretty significant Mana Rock Superiority(tm) to make that worthwhile. 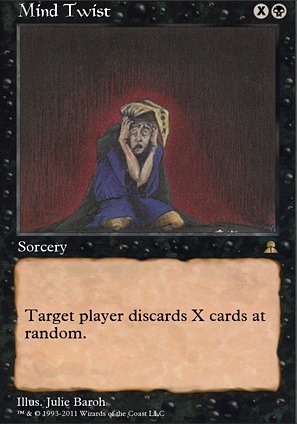 Maybe Devastating Dreams is actually a bit better than Death Cloud since you can ensure Xantcha survives, but, also discarding your whole hand asymetrically seems worse than the Death Cloud 's ability to Mind Twist the whole table. 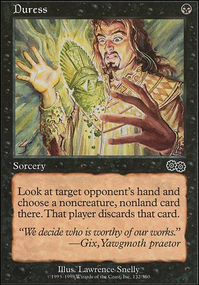 Been really interested in finding corner-case rares, Fiery Justice for example, as a weird worse Fire Covenant , one of, if not the best cEDH board wipe, Mind Twist as a great legal commander card, with the downside of only stopping one opponent, Ertai, the Corrupted as a cool commander with Hatching Plans or Induced Amnesia to get massive card advantage, Sire of Stagnation as a second Consecrated Sphinx ish effect, and Cruel Sadist as really cheap reusable removal or a big threat. Otherwise, I have just seen some really powerful effects that save your life like Delaying Shield and Soul Echo , which together let you live forever, but alone still save you a turn worst case scenario. They are both great with infinite mana too. 1 - Do not unban Jitte and SFM at the same time. That seems to be a no-brainer. SFM is a lot safer than jitte. 2 - Unban Green Sun's Zenith - I do not think this is a very powerful card. The only reason it is banned is being a good ramp spell with Dryad Arbor , which is powerful, but not that much. And it puts a significant deck building restriction on you - play a lot of green creatures. 3 - Provide a unified Pauper banlist that marries the current list for MODO to the paper one. It is very simple - just use the current one and add Hymn to Tourach , Sinkhole , Goblin Grenade and High Tide - done! 4 - Change nothing for standard. 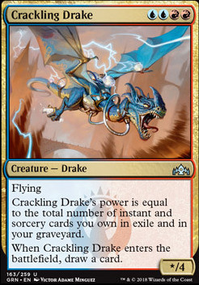 5 - Legacy - unban something non-impactful like Mind Twist or Mind's Desire .